Bernardino di Betto, who was born in Perugia and probably trained there, was known as Pintoricchio because of his small stature. His early career is undocumented, but he must have been fully-trained by 1481, when he enrolled in the Perugian painters’ guild. Via Muzzia was renamed Via Pintoricchio in 1871, and a plaque at number 47 (see Walk VI) records the properties that he bought here in the 1480s. ✴Pintoricchio was influenced at this time by the art of the newly-discovered Domus Aurea, (although the graffiti there referring to “Pintoricchio sodomita” was presumably the work of an enemy rather than of the artist himself). ✴It was also at this time (probably in 1484-6) that Nicolò di Riccomanno (Manno) Bufalini di Città di Castello, an advocate in the papal courts, commissioned him to fresco the Cappella di San Bernardino in Santa Maria d' Aracoeli. (Manno commissioned the fresco cycle in thanks to St Bernardino for resolving the conflict between his family and the Baglioni of Perugia. A panel that Pintoricchio probably also painted for him at about this time is now in the Museo del Duomo, Città di Castello - see below). This phase of his career ended with his frescoes (1492) for the Roman palace (now Palazzo Colonna) that belonged to Cardinal Giuliano della Rovere (the future Pope Julius II). Pintoricchio continued to work in Rome after the election of Pope Alexander VI in 1492: most importantly, he executed the frescoes (1492-4) of the Borgia Apartments of the Vatican Palace and was documented shortly thereafter as “pictor palatii apostolici” (effectively as court artist). Jacopo Ripanda da Bologna and Antonio da Viterbo, il Pastura were among his assistants at this time. Tiberio d’ Assisi may well have accompanied Pintoricchio to Rome to work in Santa Maria del Popolo (1485–9) and in the Borgia apartments in the Vatican Palace (ca. 1492–5). ✴from Troilo Baglioni, for his chapel in Santa Maria Maggiore, Spello in 1500-1. Pintoricchio settled in Siena in ca. 1502. 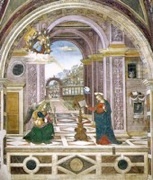 His most important work in the city was the fresco cycle (1503-08) of scenes from the life of Pope Pius II in the Piccolomini Library of the Duomo, which were commissioned by Cardinal Francesco Todeschini Piccolomini (later Pope Pius III). The altarpiece (1506-10) of the Madonna and Child with saints in Sant’ Andrea, Spello (see below) reproduces part of the text of a letter that Bishop Gentile Baglioni of Orvieto wrote to Pintoricchio in 1508, begging him to return to Siena, where Pandolfo Petrucci awaited him. Pandolfo, sometimes called the Magnificent, was in effect the Lord of Siena and Pintoricchio was involved in the frescoes (1508-9) in the so-called in the Palazzo del Magnifico there while the Spello commission was underway. Pintoricchio’s last major commission in Rome came in 1509, when Pope Julius II commissioned him to decorate the newly-rebuilt choir of Santa Maria del Popolo. He died in Siena in 1513. ✴Sixtus IV commissioned frescoes from Perugino for the Cappella della Concezione of old St Peter’s in 1479. ✴The work commissioned by Cardinal Domenico della Rovere for his chapel in Santa Maria del Popolo, which is generally attributed to Pintoricchio, seems to have been executed at some time between 1478 and 1482. It includes an altarpiece of the Adoration of the Magi that is closely related to the altarpiece (ca. 1470) from Santa Maria dei Servi,Perugia, which is attributed to Perugino. Pintoricchio might well have collaborated in Perugino’s frescoes ca. 1481-2 in the Sistine Chapel (described in the page on Perugino). Raphael seems also to have assisted Pintoricchio at this time with the design of the altarpiece (1502-5) of the Coronation of the Virgin for Santa Maria della Pietà, la Fratta (see below). Most scholars believe that the young Pintoricchio belonged to the so-called Workshop of 1473, which produced the important panels depicting miracles of St Bernardino of Siena that are now in the Galleria Nazionale. (Follow the links in the page on the Workshop of 1473 for more details). 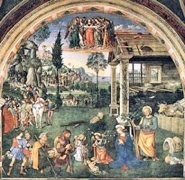 This fresco in the Palazzo dei Priori, which is the earliest documented work by Pintoricchio, was painted in the lunette of the portal that led to the Priors' dormitory. It was subsequently moved to the Sala del Consiglio (on the first floor, overlooking Corso Vannucci). The fresco depicts a half-length, standing Madonna and Child in a mandorla of putti, with standing angels to the sides, Pintoricchio must have returned briefly from Rome in order to make his contribution to what was probably largely a workshop production. 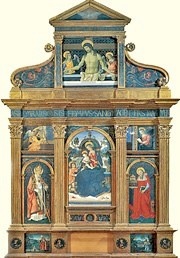 This altarpiece was commissioned for the high altar of Santa Maria degli Angeli (or dei Fossi), the newly-built church of a community of Augustinian Canons. The history of its commissioning begins in 1479, when the wealthy Melchiorre di Goro, who had close links with the canons, wrote a will in which he provided for such an altarpiece. He died before 1492, when his heirs commissioned Mattia di Tommaso da Reggio to build the frame (described as a tabernacle) for the altarpiece. This was in place on the altar and awaiting painting by 1495. It seems likely that Pintoricchio had been associated with the project for some time, and that he had designed the frame and probably planned the composition. However, a series of codicils to Melchiorre’s will reduced had reduced the sum of money that was available for the commission, and it was only in February 1495 that sufficient funds were in place to support a formal contract. This was agreed between the artist and Prior Girolamo di Francesco da Venezia, who specified the iconography of the altarpiece in some detail. Alfano Alfani administered the funds that were deposited by the canons and paid to Pintoricchio, who was compensated for the rent of a workshop and undertook to complete the work in two years. This was the most important commission that Pintoricchio ever received in his native Perugia, and it received extraordinary acclaim when it was unveiled. It was influential with other contemporary artists, including the young Raphael. It was still in situ in 1732 but had been dismembered by 1784, when its components were in the choir. The panels escaped the Napoleonic expropriations and were reconstituted in the original frame in 1863. The altarpiece is now in the Galleria Nazionale. ✴Small panels flanking the upper part of the central panel depict the figures of the Annunciation. ✴The central panel depicts the Madonna and Child enthroned with the young St John the Baptist, who hands a reed Cross to the baby Jesus as a sign of His fate. Christ holds a pomegranate, the symbol of redemption. The inscription underneath reads: “O holy child [i.e. St John], give this cross to the Child. You will not carry it to God on behalf of the world; there will be another”. ✴The panel in the top register depicts the Pietà, with angels holding the arms of the dead Christ, revealing His wounded hands. The inscription below, which may not be original, translates: “Look, O mortal, by what blood you have been redeemed. Make sure that it has not been shed in vain”. ✴The presence of St Jerome was specified in the will of Melchiorre di Goro. He is dressed as a cardinal, is accompanied by his lion, and carries a model of a centrally-planned church with a portico. This church, which is repeated in the landscape to the left of the Madonna’s throne, does not seem to represent Santa Maria degli Angeli but might represent the Pantheon, Rome. ✴St Augustine, the founder of the order to which the canons of Santa Maria degli Angeli belonged, carries an apple as a symbol of redemption. All of this faithfully reflected the terms of the original contract. •a saint whose name is difficult to read but was apparently St Dignamerita. •St Augustine on the left speaks to a child who is trying to pour the sea, cup by cup, into a hole in the sand. The story goes that, when St Augustine asked her how she could hope to succeed in this immense task, she asked him how he could hope to understand the mystery of Christ’s incarnation. •St Jerome on the right is depicted as a hermit in the desert, contemplating the Crucifixion. ✴the Evangelists in the tondi under the four pilasters. ✴Alfano Alfani, whom Alexander VI was to appoint as vice-treasurer of the Apostolic Province of Umbria in 1499. Alexander VI and his young son, then Cardinal Cesare Borgia, must have been duly gratified when they heard about the commission during their 16-day stay in Perugia in June 1495. However, they apparently departed among the curses of the citizens, presumably because of their own behaviour and that of their considerable entourage. The change of plan for the predella could have occurred at this point, or perhaps after the death of Alexander VI in 1503. The Confraternita di Sant’ Agostino commissioned this silk banner from Pintoricchio for the Oratorio di Sant' Agostino. It later passed into the ownership of Silvestro Friggeri Boldrini, and he donated it to the Accademia di Belle Arte in 1868 and is now in the Galleria Nazionale. The banner depicts St Augustine enthroned with three kneeling figures of members of the flagellant confraternity. This panel in the Museo del Duomo was formerly in the Bufalini collection. This implies that Nicolò di Riccomanno (Manno) Bufalini di Città di Castello commissioned it, probably in Rome. (As mentioned above, he had certainly commissioned Pintoricchio to fresco the Cappella di San Bernardino in Santa Maria d' Aracoeli in Rome in 1484-6). 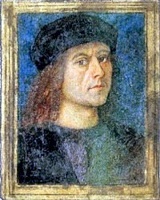 Nicolò di Manno was at this time an advocate in the papal courts in Rome, and he had commissioned the fresco cycle in thanks to San Bernardino (died 1444) for resolving the conflict between his family and the Baglioni of Perugia. The Observant Franciscans of Santa Maria della Pietà, la Fratta (now Umbertide, some 20 km south of Città di Castello), commissioned this altarpiece from Pintoricchio in December 1502. It was to be painted for a frame that already existed on the high altar of their church. The cost was agreed at 100 scudi, to be paid in three instalments over the four months allowed for the work. Pintoricchio was also to receive expenses for himself and his “soci e famuli”. 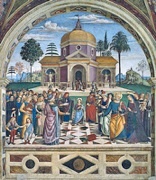 The friars required that the composition should be based on that of the Coronation of the Virgin (1486) that Domenico Ghirlandaio had painted for the high altar of the church of another Observant Franciscan convent, San Girolamo, Narni. ✴Camillo Caporali received 40 scudi in October 1505 on behalf of Pintoricchio and of his own brother, Giovanni Battista Caporali. ✴the 2nd Apostle on the left in Pintoricchio’s altarpiece is taken from the figure of St Thomas in Raphael’s. The payment to Giovanni Battista Caporali suggests his involvement, at least in the later stages. •St Ambrose in his study. The vaults contain figures of four sibyls. ✴and Andrea d’ Assisi, l’ Ingegno. Works in Spello that are attributed to these artists and date to this period are now in the Cappella dei Canonici of Santa Maria Maggiore and the Pinacoteca Comunale. This angel is painted above a washbasin in the ex-sacristy of Santa Maria Maggiore. The inscription reads “LAVAMINI ET MUNDI ESTOTE” (wash yourself and be pure). It is attributed to Pintoricchio, and was probably painted while he was at work in the Cappella Bella (above). This panel belonged to an altarpiece that the procurators of Sant’ Andrea commissioned from Pintoricchio in 1506 for the high altar. The artist might have started it soon after, but by 1507 he had moved to Siena. He therefore subcontracted Eusebio di San Giorgio to continue the project to his design, which he had entrusted to a local artist, Tommaso Corbo. ✴in 1510, he commissioned Giovanni Francesco Ciambella, il Fantasia to execute the frame to his design and painted a tondo of the Risen Christ that was inserted into it. The local historian Fausto Gentile Donnola documented the altarpiece on the high altar in ca. 1621. His description is the only surviving record of its predella, which contained small but exquisite scenes from the Passion of Christ. The original frame and most of the panels from the predella were lost, probably when the main panel was moved to its current location in the right transept. The tondo of the Risen Christ mentioned above survived and was incorporated into the pulpit in the 19th century. The panel in the right transept depicts the Madonna and Child enthroned, with SS Andrew, Francis, Louis of Toulouse and Laurence, set against a landscape. Angels flank the throne and the young St John the Baptist sits on the steps below it. The document on the small table in the foreground reproduces part of the text of a letter that Bishop Gentile Baglioni of Orvieto wrote to Pintoricchio in 1508, begging him to return to Siena, where Pandolfo Petrucci awaited him (see above). Bishop Costantino Eroli, who built this chapel at the beginning of the right aisle of the Duomo, presumably commissioned its decoration. The design of the chapel, including the framing of the frescoes on its altar wall, is usually attributed to Ambrogio Barocci. The attribution of the frescoes in the chapel to Pintoricchio was first made in 1848, but it is now generally accepted. The architectural frieze around the chapel might have been inspired by that designed by Pintoricchio in ca. 1492 for the Borgia apartments in the Vatican. ✴The fresco in the lunette above the altar depicts God the Father seated on clouds within a mandorla. Two angels (one badly damaged) kneel to the sides. ✴The fresco that occupies the curved wall of the apse and acts as an altarpiece depicts the Madonna and Child are enthroned between two trees (a palm tree and a locust tree) with SS John the Baptist and Leonard to the sides. The scene is set outside the walls of a city by a lake. Outside one of the city gates, to the right of the Madonna and Child, a Dominican preaches to a large crowd. The fresco was restored in 1932 in an effort to repair the damage caused by the humid conditions in the chapel. Unfortunately, the cloak of the Madonna and that of St John the Baptist, which had been applied “al secco”, were beyond repair. ✴A damaged fresco of the acts as a fictive frontal to the altar. •scenes from the life of the Emperor Constantine between them (illustrated here). Only one sibyl and one scene from the life of the Emperor Constantine survive. The provenance of this panel is unknown before 1872, when it was documented in the civic collection. It is now in the Pinacoteca. The panel has usually been attributed to Pintoricchio, and this attribution has been strengthened following its recent restoration. It may well have been a model for a similar but more finished image in the National Gallery, London, which is also attributed to Pintoricchio. Return to Art in: Città di Castello Orvieto Perugia Spello Spoleto Trevi.